If this is indeed the fact, a certain controller needs to be formally sued for causing so much damage to so many shareholders. The stock is now back to where it was before this whole circus started. 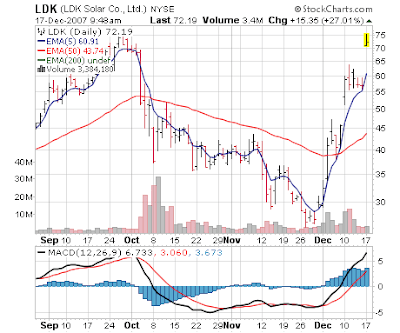 LDK Solar Co. said Monday its investigation into whether it had incorrectly reported its silicon inventories found "no material errors" in the inventories. The solar-product maker's investigation stemmed from allegations of its former financial controller, Charley Situ, that LDK had a 250-ton inventory discrepancy and poor financial controls. The company said Situ did not take into account all the locations where the company stores its silicon -- an important component of solar products. It also concluded that a provision for obsolete or excess silicon is not required because LDK is using each of its silicon types in wafer production. The company will report its third-quarter results, which had been delayed as a result of the investigation, on Wednesday. Outside directors Louis Hsieh and Bing Xiang oversaw the investigation, which was conducted by the audit committee's independent counsel Simpson Thacher & Bartlett LLP and an accounting firm that was separate from the company's external auditors. Independent experts in the evaluation of silicon feedstock and the production of multicrystalline solar wafers also assisted. Again pending the news I had just a small position (tiny in fact) in this name; now on any pullbacks, this is a buy. I will be very curious to see if Wednesday they still report gross margins in the low 30s, which was the case in the past before these allegations came to the forefront. What is unusual is this is not driving other solar stocks upward... as this sort of news generally creates euphoria across the sector. Might indicate the sector is currently 'tuckered out' after a huge run and needs to consolidate here.